Every Logisim project is actually a library of circuits. In its simplest form, each project has only one circuit (called "main" by default), but it is easy to add more: Select Add Circuit... from the Project menu, and type any name you like for the new circuit you want to create. Suppose we want to build a 2-to-1 multiplexer named "2:1 MUX." After adding the circuit, Logisim will look like this. 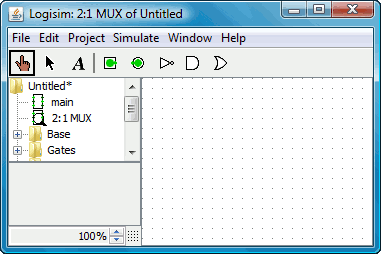 In the explorer pane, you can now see that the project now contains two circuits, "main", and "2:1 MUX." 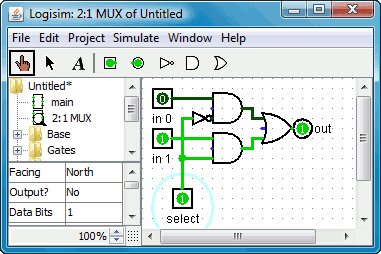 Logisim draws a magnifying glass over the icon of the circuit currently being viewed; the current circuit name also appears in the window's title bar. After editing the circuit to appear like a 2:1 multiplexer, we might end up with the following circuit.